Welcome to Logger32, a 32-bit Amateur Radio logging program written by Bob Furzer, K4CY. Bob is also the author of Zakanaka, and an older 16-bit version of Logger. Logger32 is currently supported to run under Windows 7, 8, 8.1 and 10. 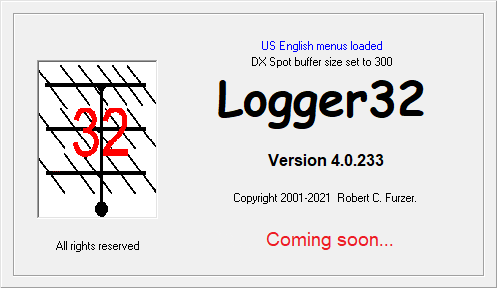 Logger32 may still run (with reduced functionality) under earlier Windows versions, however, updates are no longer suppled for those obsolete Operating Systems. See the Program page for more details. Logger32 has been developed to be a highly user configurable general purpose Amateur Radio logbook with computer control support for many radios and antenna rotators. It is NOT a contesting log, although there is no real reason why it could not be used for such, and does not contain some features that might be found in software specifically designed for this activity. Thanks to Petr, M0WTF (OK1THA) and Zen systems for providing a European Mirror Site for many years since July 2009 without any bandwidth limitations. Petr and Zen Systems have now further stepped up support and is hosting the full Logger32 website as of Dec. 2012. The Logger32 community is grateful for this kind gesture and appreciate the continued support with this high bandwidth hosting service. Thanks to David, KY1V and ASPwebhosting.com for providing full hosting and support of the main Logger32 web site for the past 2 years from Aug. 2010 until Dec. 2012. Thanks also go out to Andy K3UK for providing a high bandwidth download location to host the large install and help files in the past from 2006 to 2009. The Logger32 community would like to thank Derek KC4ELO for the support in maintaining the early Logger website for many years till 2006. This Logger32.Net web domain is provided by Prasad, VU2PTT who as Webmaster also manages the ongoing web page updates and new releases of Logger32 on this website since Feb. 2006.